Beautifully engraved certificate from the East Tennessee, Virginia and Georgia Railway Company issued in 1887. This historic document was printed by the Homer Lee Banknote Company and has an ornate border around it with a vignette of allegorical women holding a balance scale with a woman and man on her sides. These is also a vignette of a train. 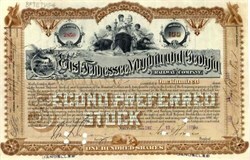 This item is hand signed by the Company�s President and Secretary and is over 117 years old. The East Tennessee, Virginia and Georgia Railroad Company was created in Tennessee (1869) through the consolidation of the East Tennessee and Georgia Railroad Company with the East Tennessee and Virginia Railroad Company. It was sold under foreclosure (1886) and reorganized as the East Tennessee, Virginia and Georgia Railway Company. The East Tennessee, Virginia and Georgia Railway Company was controlled by the Richmond Terminal Company from 1887 to 1892 and purchased by the Southern Railway Company in 1896. The line is now part of the Norfolk Southern.